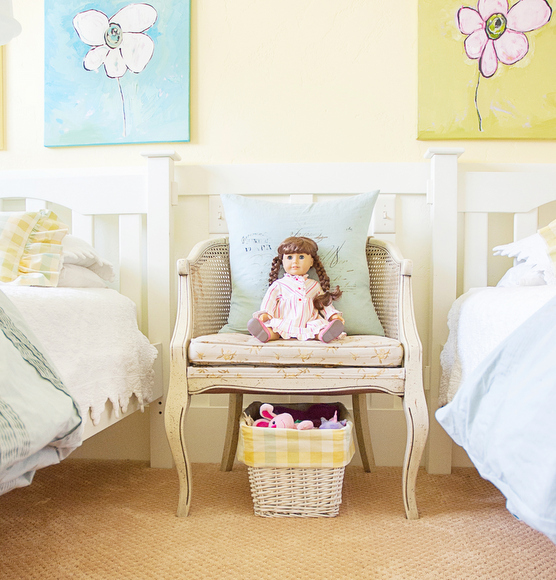 I’m so excited to share my girls’ bedroom with you today! 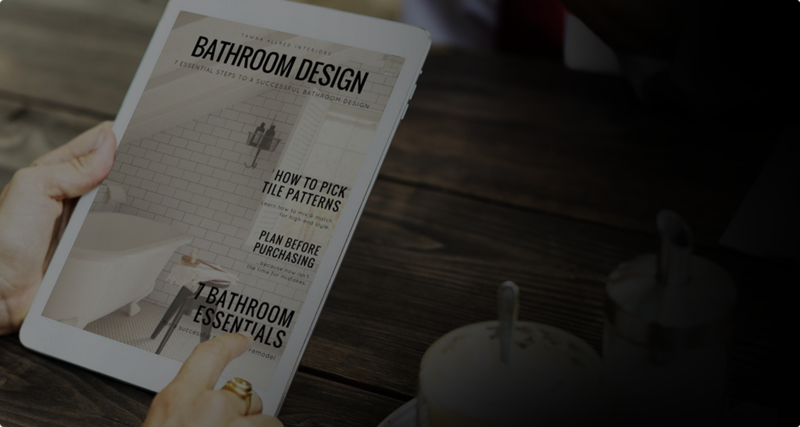 While I have the best intentions with my own home, it seems I rarely ever finish a space. When I say “finish”, I mean right down to the accessories. There’s always something to do, right? My girls’ room needed to “grow up” a little. A nine year old and a four year old share it, so it also couldn’t be too “grown up”. Another criteria : it needed to fit our home….our country home. And it needed to be flexible, so I didn’t have to re-do it in another few years. My oldest daughter wanted it hot pink. That request would fall under the “have to re-do in a few years” category, so we worked together and settled on yellow. It’s a bright, happy color, but it’s a lot more flexible! This is how the room looked when we bought it. 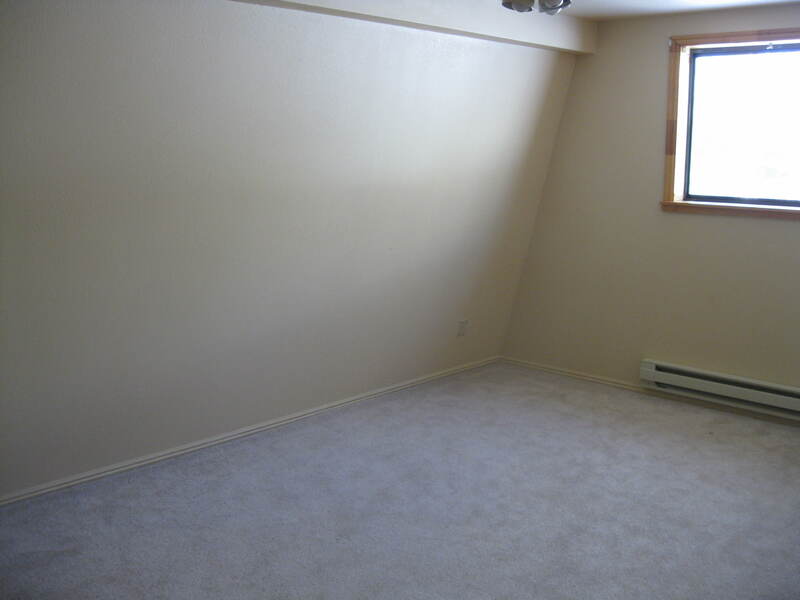 Pine trim, peach walls (with a LOT of holes), and stained carpet. Floorboard heaters lined the window. One fan light combo in the middle of the room (i.e. terrible lighting). We worked hard on it before we moved in. We chose the yellow walls, switched out the pine trim and closet doors, installed a wainscoat, re-textured the drywall, re-did carpeting, and put in can lights (our ceilings are low upstairs). Then I made do with some quilts we bought years ago from Pottery Barn. One was a queen and didn’t fit, but we lived with it. Oh, and the beds are an old bunk bed, also from Pottery Barn but found on discount at a store called DownEast Outfitters, that is separated. This is what it looked like for about a year. 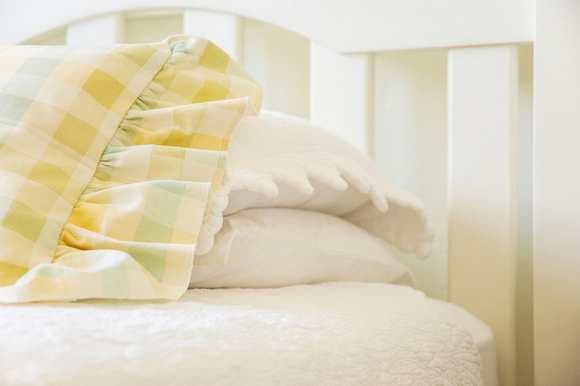 Nice and happy, but a bit of a copy-cat design one might see in a Pottery Barn magazine….if the quilt fit! Then I finally found some fantastic pendant lights from One Kings Lane, and the “final” design took off. They are replicas of old schoolhouse pendants, so they fit our house nicely. I was able to find a plaid fabric from Fabric Guru (only $7 a yard) that tied in the yellow, white, green, and blue color scheme of the room. I re-painted the pictures in the above photo to match the room. So here is what it looks like now. A huge thanks to Rebecca from Rebecca White Photography, who came and took the photos for me! 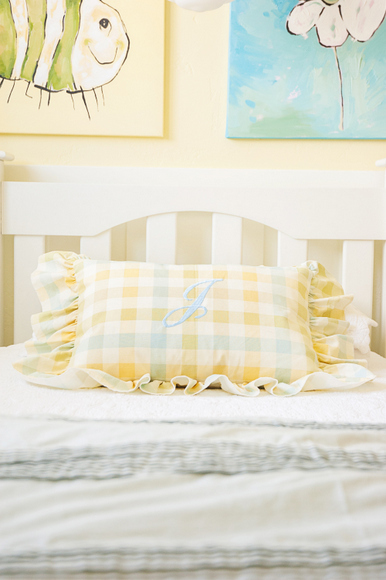 Also, those fabulous ruffled, monogrammed pillows were sewn by Brenda Bateman. She owns her own business called Pieceful Imaginations, and has done custom sewing for designer homes in the Wilson/Jackson area. She does amazing work. If you need something done, you can call her @ (307)886-7891. My girls are happy, and it feels so wonderful in their room! As they grow, the only thing I’ll have to do is switch out the paintings over their beds. I think some beautiful, antique botanical prints will look lovely. 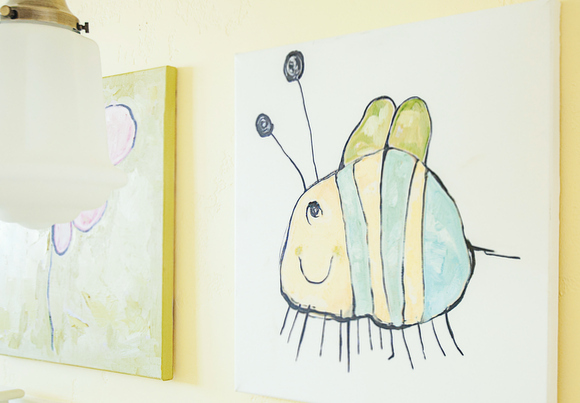 My oldest drew those funny bees and flowers years ago though, and I’m afraid I might have a hard time ever taking them down. Beautiful! So cheery and light. I’m sure your girls LOVE it! Really, Lovely, but I would worry about heads bumping into those pendant lights. My boys would find every possible way to make it to the ER. Once time a friend even bumped his head on a ceiling fan….boys. Maybe girls are different. You definitely have to consider the kids that are using the room! My girls are pretty calm, and I can even sit up underneath them. I find them to be much easier to manage than table lamps :). Such simple sweetness. If I had girls I would want their room to look just like this! What I can’t believe is the paintings are your sons! They are so beautiful. Thank you. The bee and flower were tiny sketches on a piece of paper. I isolated and enlarged them. That bee always makes me smile. Nothing compares to the imagination of children! I’m afraid I painted this room a few years ago, and I can’t remember the color! It was a True Value Color, and when I looked on their website, it seems close to the color “Buttercup”. The number on that was 13B2. 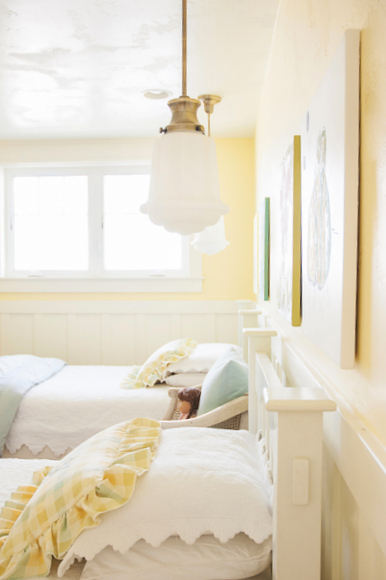 My girls’ room has north light coming into it (weak, cool light), and so a happy yellow worked great. 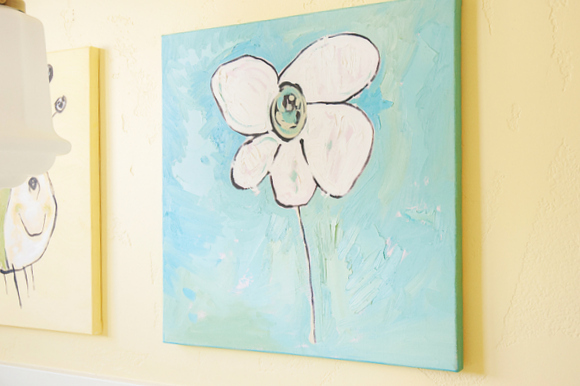 Every room is different, so I will email you a few tips on picking out the perfect yellow. I love this room! 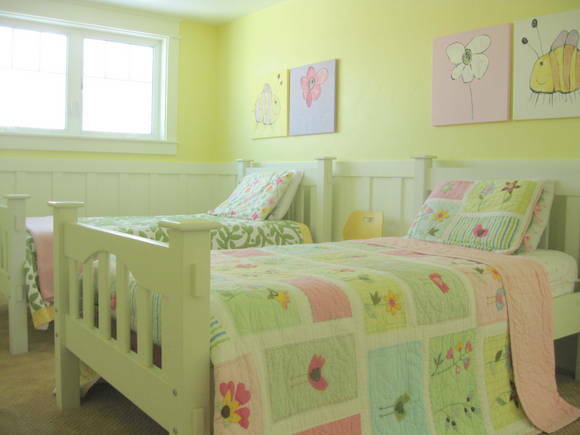 I just bought new bedding for my 10 year old daugher’s room and we now need to paint walls a light buttery yellow. Just wondering if you could also send me an email with tips on how to pick the perfect yellow. 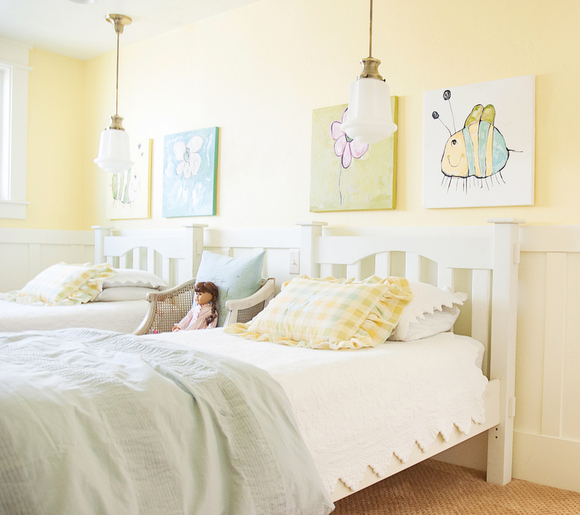 When she was a baby her nursery was yellow and it glowed!